We pride ourselves on our bespoke approach to aesthetics, enabling you to achieve optimal results. 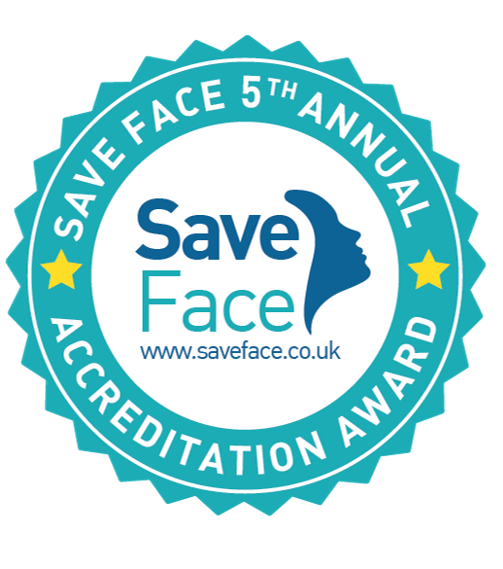 Excellent customer service and satisfaction is at the heart of our clinic and we are proud to demonstrate this via our Save Face excellence accreditation, based on independent patient reviews. For a few years I had my wrinkle relaxing injections regularly with Kay, then I lived abroad for a while and had to use someone else. I was unhappy with two different providers I used. This really highlighted the professionalism and quality of my recent treatment with Kay. I had my first full face collagen microneedling. Dr Maryam kindly explained the procedure very well. My skin healed very well soon after and never been so good. I am booking my next one. Absolutely 10 of 10. Best place for lip fillers. Service is really good, Maryam took her time, and she definitely knows what she’s doing. If you’re looking for a place to get your lips done, then I can recommend this place for sure!! Kay and Maryam are both good in their job, I feel really comfortable with them. See you within 6 months! I’m so happy to have discovered Regent’s Park Aesthetics. I have had treatments with 3 of the practitioners and I find them all to be friendly and efficient. The treatments are also reasonably priced. I would highly Recommend this clinic. I had lip fillers two weeks ago and very with the results. Amie was fantastic, put me at ease immediately and two weeks later I am so happy with the results. This was my first appointment with her and my best experience and results to date. Highly recommend Amie and Regents Park Aesthetics as a whole. As usual Maryam worked her magic, totally professional. I trust her implicitly. My appointment with Dr. Maryam was absolutely pleasant and results are better then I wanted. This was my second visit and I couldn’t recommend her more. Very satisfied with my treatment here at the clinic, would highly recommend. I had micro needling for the first time for acne scarring on my cheeks. I was anxious because I knew the red face would occur. Kay was awesome in managing that anx done. It didn’t hurt – yes I was red after and struggled looking at myself but two days later the red was totally gone. And Kay checked in with me and I with her. She never once failed to respond to my texts. Which is pretty on point after care. The best bit it this stuff really works. After one session my skin looks so much better. Friends have noticed and two have asked if I had make up on. I’m sceptical about most ‘get rid of your acne scars’ treatment but this stuff is the real deal. Next session booked at I’m looking forward to it! I will update with another after that session.. I have visited Regents Park Aesthetics twice now, and both times have left extremely happy with the results. Dr. Maryam is extremely caring and always makes sure the result is as natural as possible. She made sure I was comfortable and gave great aftercare instructions. I will return again and again! Maryam is amazing, i will definitely be back! Doctor Maryam was very understanding, the procedure painless and it was a pleasure to visit your clinic. Kay is excellent. She put me at ease and the results are fantastic. I’ve been seeing Dr. Maryam for my treatments for a while now. She is excellent at what she does and makes you feel comfortable at all times. She doesn’t rush any treatment and answers any questions you might have. I always leave feeling satisfied with my results. Thank you Maryam for excellent customer care. Thank you Dr Maryam! I’m really happy with the results of my Botox, and you have a customer for life! The clinic is easy to find, clean and friendly. Dr Maryam took very good care of me and made me feel really relaxed (I’m a bit of a baby!) The prices are better then you will find anywhere in the area, as well. Will recommend over and over again. Just had to write some glowing words about the wonderful Kay and Maryam. As well as being amazing at what they do, they are truly warm, welcoming, knowledgable, professional, and honest. They never rush you and are more than happy to answer all the questions you may have and I usually have a lot! Great results and client care! Excellent service and professional, friendly staff. Very professional and friendly staff. Very good service. Impressive service. Dr Osmani was very attentive and made me feel comfortable during the procedure. I even went for a top up after my initial treatment which they were happy to do. I would definatley reccomend them. Perfect result as always. Thank you Kay. Very informative and kind when I have enquiries about procedures. After a lot of research I decided to see Dr Osmani for botox and filler package. It was my first time so I was quite nervous. I couldn’t have picked a better practitioner. Not only Dr Maryam is super friendly and knowledgeable, I was very impressed with her gentle touch as well. The consultation was thorough and she listened to all my questions, gave me loads of information and was extremely nice to talk to. Treatment itself was virtually painless. She used a numbing cream in my smile lines where I’ve had filler. I had absolutely no bruising and minimal swelling only for a few hours just after. I wanted a natural, fresh look and that’s exactly what we’ve achieved. She told me to come for a follow up after 2 weeks to see if I’m happy with results, which I did and all was great. Absolutely lovely lady, who knows what she’s doing. I’m very happy with my first experience. Definitely recommend. I had my Botox follow up today and as usual Maryam was very professional and Pleasant. I feel very confident in her ability and have not been disappointed so far. I’m so pleased with my results and can’t thank Kay enough for my treatments! I would highly recommend! I had a consultation with Dr Maryam for cheek fillers a few weeks ago. So impressed, I was back a week later for the treatment and will be back in another week or so for an additional treatment. Dr Maryam just oozes talent and professionalism in what she does. I went along (totally new to all this) quite apprehensive and unsure that I would find someone that knows exactly how to enhance a male face as most clinics market mainly towards women. Dr Maryam put all my fears to rest, most without me even needing to ask the question. She makes everything totally transparent and walks you through everything. What really won me over was Dr Maryams refusal to do everything I ask. I went in asking for cheek, temple and jaw fillers (asking for quite a lot of filler to be added). Dr Maryam explained how exactly what I was asking for was unnesessary and likely excessive to achieve the result I was looking for so actually refused all that additional business. Caring that I get a good and natural result over financial gain certainly gains my respect. Fast forward to actually getting my cheek filler treatment and the process was so much easier than I expected. Pain at its worse was 2/10 and again Dr Maryam is talking you through every last detail and explaining what the target result is. She has a real eye for detail and ensuring symmetry. I had a very small ammount added for an initial treatment (just .5ml each side) but the results were instant and noticeable in a good way. Another treatment to gain that extra bit of volume and I know I am going to be extremely happy. Overall I have only good to say about the clinic and definetly Dr Maryam who is just wonderful at what she does and totally lovely at the same time. I will return soon and my Mum even wants to come for a consultation at the same time! 5* for sure. Dr Maryam was very attentive and detailed. She made me feel comfortable as we talked about the treatment I was to have. She was also very careful and ensured that the treatment was effective. I am very pleased with the service I received as well as the end result. Dr Maryam is very informed and very helpful with information. She doesn’t recommend treatments she doesn’t feel will benefit you. Have returned for further treatment and will go back. Amazing service from Maryam and Kay, thank you, ladies! It took a while to find the right Doctor for me. I scoured the internet and saw a few different doctors before I found the right one. I am very happy to say that I have now found her. I knew the look that I wanted to achieve and Dr Maryam listened carefully to my needs, in order to achieve this. She expertly explained the processes, with transparency. I couldn’t be happier with the results of my treatment and I won’t be going anywhere else from now on. Thank you, Maryam! I had various treatments by Kay and Maryam as well and was always very please with the results! These two ladies are very professional and reliable. The clinic is at a very convenient central location and they are open until late which allows me to visit after I finished work. After a few bad experiences with lip filler I am so glad I stumbled across Kay’s clinic. I cannot recommend her enough. She’s highly professional, and takes the time to listen to exactly what you want to achieve. She explained everything to me, so I knew what to expect. My lips are just how I wanted them! I couldn’t be happier. I will definitely be back for other treatments. Thank you so much Kay! I have been seeing Kay for a long time. Just a bit of botox and a little filler. Kay is special because she knows my face and it is her ability to spot the areas which will be helped by the tiniest bit of filler and very subtle touch of botox. Kay offers me a bespoke treatment package …definitely not one size fits all. It’s hard to say it :~》….but at getting on for 67 everyone notices how “fresh” I look…including my dentist who is an aesthetic practitioner herself. Thank you so much darling Kay. 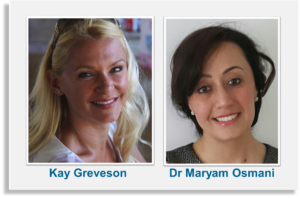 Both Kay and Maryam are very professional and offer great advice and treatments. I would definitely not go anywhere else. True professionals. I was recomended Dr. Maryam by my Friend who had previous experience with Dr. Maryam. Outstanding service. Dr. Maryam is a very lovely lady – she made me feel very comfortable and relaxed – I’m absolutely pleased with the results and can’t wait to visit again! Thank you so much Dr. Maryam for making us look beautiful!!! Delighted with my treatments at the clinic. The girls are really friendly and professional. They make it an enjoyable experience. I would highly recommend ! Kay is fantastic. For someone who suffers with nerves she made me feel at ease straight away, she’s calming , patient and understanding, and I’m really happy I found her and will return for further treatments. I have been going to Kay for a few years since she started out. Kay always discusses what you want to achieve and gives honest advice. She’s always friendly and puts you at ease. Before finding Kay I had been to other practitioners and I know the difference between someone who thinks about what will look right for their client and someone who doesn’t. Kay has never tried to get me to have more treatments when i don’t need them, unlike others I’ve been to. Dr. Maryam did an amazing job of removing my crow’s feet with Botox, while still looking very natural. Friends and family I was visiting in South Africa were amazed at how young I looked. I also had some fillers for lines on my upper lip and the results are great. The cost is very competitive and results amazing. I highly recommend Dr. Maryam, as well as being an incredible Doctor, she is also a lovely person. Dr. Maryam is also very co conservative and honest and makes you feel very relaxed. I have had 2 threadlifts, both done by Kay, and the results are really pleasing. Kay is very professional, knows her stuff, and always goes for a natural result. Seen Dr Osmani twice now. Both times she was amazing. She listened and made recommendations and she got it absolutely spot on. My first procedure ever and I was delighted and equally delighted with my second. Recommended my friend as I was so pleased with what she did for me. She’s also absolutely lovely. Kind, positive and very reasurring. I knew I was in the best hands. Thank you. Both these ladies are utterly fantastic they just know what you need and are thoroughly professional in all aspects of their procedures… Would highly recommend to anyone. I was well looked after by Maryam since the time I decided to get dermal fillers. Maryam was always really helpful and did an amazing job! My dark circles are gone! After two weeks I had my follow up and I could not be happier with the results. Had botox injections with the lovely Dr Maryam. Very happy with the high level of service provided, really nice, clean and quite luxury environment. I felt I needed a top up and Dr Maryam was happy to oblige. Good service all round and very pleased with the results. Kay is very professional, calm and respectful. I can’t say any negative thing about her or the treatment. I will go back to her! Maryann is very contientious and thorough. She doesn’t intimidate you at all, and makes sure to only give you the treatments you need, rather than what you don’t need. She’s thorough and always gives a lovely service. Both Kay and Myryam are lovely to deal with ..service is excellent and I have never needed to go for a follow up treatment as they always do the treatments well first time. I’m so happy I found regents park aesthetics. But, I’m extremely happy I found Dr Maryam Osmani. I had many treatments done by her, such as botox, fillers and micro-needling. The results are amazing. She is just the best at her job. She is wonderful and I can’t thank her enough for her professionalism and what she has done for me. Thank you! A positive and professional experience. Excellent care from both Natasha and maryam as always. Highly recommended. Maryam is simply wonderful! So professional, doesn’t recommend things you don’t need, but suggests other treatments which may be more appropriate to your needs. She is extremely kind and caring and genuinely interested in giving her clients the best treatment experience. I cannot recommend her highly enough. After much research, I am so pleased that I went with Regents Park Aesthetics. I choose this place after a bad experience I had from a very exclusive clinic. Both Kay and Maryam are highly qualified and very professional in their approach. I had my initial treatment with Kay, she clearly explained the procedure and the aftercare for me. The treatment was painless and straight forward. No marks, bruise or swellings. My 2 weeks review was done by Maryam. She was very honest and professional which made me believe that there are still people with ethics and values. I am very pleased to have visited this place and will be doing future treatments with them. If you want professional and high-quality treatments to an affordable price, then Regent Park Aesthetics is the place. I couldn’t be happier with my treatment and choice of clinic. Thank you very much to both Maryam and Kay. Professional, high-end clinic. Fantastic subtle result…just exactly what I wanted. Excellent, very professional service by both practitioners. I highly recommend them. I had dermal needling for some acne scarring on my cheeks. Couldn’t recommend Natasha highly enough – she’s knowledgable, friendly, communicated the procedure and what to expect afterwards well, and my skin has already shown great improvement after one session. Every time I have visited regents park the treatments are impeccable and the team are fantastic. .I highly recommend this clinic to everyone,you get what you pay for and a whole lot more. Maryam was a delight and have received some of the best results than i ever had previously for botox. Love the clinicians, love the venue, love my face post-treatment, highly recommend. Previously had Botox over the last few years with Kay, but decided to have a Derma filler too this time. Kay put me at ease explained what it was and how it worked etc. I will be having it done again, when time needed. I was happy with the results, would definitely book again. Really pleased with Dr Osmani’s advice and very happy with the results. An excellent experience Kay made me feel confident and well formed about the procedure and the results were just what I wanted ! Honest feedback on what will work for me and great results. Fantastic experience thank you . The results were great & could not recommend this clinic more highly. This was my first time visiting Maryam & I was so impressed with the treatment. She gave me lots of information & answered all my questions. Highly recommended clinic – can’t wait for my next treatment! I came to Kay after a recommendation from my mum, I wouldn’t go to anyone else now! Kay is very knowledgeable and just gets it right! I would highly recommend Kay and Regents Park Aesthetics to anyone looking for treatments. So happy with my results! Would recommend Kay and this Clinic. I have been here 3 times now. I already have a quite big bottom natural lip. I only ever wanted to do my top lip to even them out. It took me a while to get my top lip done as I always quite scared it would look fake. Both Kay & Maryam have done my lips & they are AMAZING! Nobody even notices them as they look SO natural & when they do notice I get non stop positive comments. I would highly recommend these two wonderful ladies & will always go back to them. I’m very loyal once I find a place I truly like & will recommend more friends & family. Thanks again for such an amazing results. Kind regards. Lila. After a free & thorough consultation with Kay I decided to procede with the HIFU treatment on my lower face and jawline. The treatment itself was fine, a few tingles now and again but nothing too bothersome and those tingles were a sign that the machine was working its magic! Kay is very good and explains everything prior to treatment do you know what to expect. It has helped firm up my problem areas and the skin generally feels better. I would use Kay again for other treatments. She’s very friendly and non pushy and is very honest to what you DONT need too. I get the impression Kay would only carry out a treatment if she feels it is suitable and would also make a difference. This is reassuring. Kay takes time to answer any questions and concerns. Very nice clinic too and competitive prices with good availablity. I have had treatments with both Kay and Maryam and have been delighted with the results also I think the packages they offer are a great idea. I would recommend this clinic for anyone considering cosmetic treatments. Another fantastic treatment for a couple of areas with Kay. I had filler as well as botox in a few areas. Kay was helpful before the treatment, and after. Would definitely reccomend to others. And will be trying out the fat freezing treatment going forward. Thank you Kay. Couldn’t fault the service, friendly and thorough and really pleased with the results. Thank you very much to Maryam she is so beautiful and sweet doctor and I’m so happy with resolute, I’m going back to her very soon. I had some upper lip fillers to reduce the appearance of my ‘smokers’ lines. Kay made me feel comfortable and in safe hands. I am very pleased with the results and would be more than happy to recommend her to my friends and family. I have had treatment both by Kay and Maryam. Both of them have impressed me with professionalism, warmth and knowledge. I was slightly reticent about posting this review, as when you come across a gem, you do not want to tell too many people about it. However on their behalf I will give this review as there are not many people like them in this industry, and I have met quite a few in my time. They deserve everyone of their 5 stars. Without a doubt the best around…if you are considering any type of treatment you must visit Regents Park Aesthetics first! Very happy with the results will be back friendly and very knowledgeable doctor. I reviewed this clinic and trialled the Botox. The staff were friendly and professional, the treatment was painless and the results fantastic. I would recommend. Dr Maryam provides an exceptional service, she goes out of her way to make sure the client is happy and she couldn’t do more for you! She is extremely honest and constructive in the advise she gives and I am so pleased with the overall service I have experienced with Regents Park Aesthetics. I couldn’t recommend them enough and I have been to many clinics! Thank you again! Really happy with treatment and Kay is a star as always and very informative. I know in safe experienced hands. Every time I visit this clinic I am always surprised at how happy I am with the results. Kay always goes above and beyond, she is great at what she does and eases any concerns I might have. I highly recommend visiting this clinic. With having my first botox treatment 6 months ago with the clinic, Kay made me feel at ease and explained everything carefully. Just went in for my second treatment and had Maryam, who was also amazing, explained options and made me feel welcome. Recommend to everyone who’s considering getting a treatment, especially if it’s your first time. A great clinic, with top-notch staff. Highly recommended. This was my first time to the clinic. Dr Maryam Osmani explained everything and made me feel relaxed and welcome. I defiantly would recommend to friend and family.Thank you! Dr Osmani went out of her way to make me feel welcome, comfortable and informed. She is obviously incredibly knowledgable, experienced and has a wonderful way with clients. She answered all my questions about the injectables, the anatomy of the mouth, and others patiently and with great care. She is a qualified general surgeon, and it shows in her practice. As someone who has a history of allergies, this put me immediately at ease, knowing that if anything were to go awry, she, as a surgeon, would be very well placed to handle the emergency. It was my first experience with lip fillers , and after an extensive consultation about my desired outcome, a thorough explanation of the options and process, she achieved a fantastic result. She conferred with me throughout the injecting stage about my feelings on the progress so far, and any adjustments I felt were necessary. I’m thrilled with the look of my lips. She got it spot on, and has an incredible eye for balance, symmetry, and assessing the specifics of a face and mouth shape. I couldn’t have been happier with her work and her way. Highly recommend her services. money a very rare thing in this day and age. I could not recommend her highly enough. I live abroad now and whenever I am in town I will come and see Kay over anyone in the country I am living. Kay’s expertise and professionalism are evident from first meeting her. The advice I received and the treatment were exactly what I’d be looking for. Extremely satisfied with the results and aftercare. First rate practitioner. Kay is top of her field for sheer professionalism and expertise. My treatments were painless and the results were exactly what I wished for. Kay gives excellent advice and the after-care is excellent. In addition she keeps up with developments in the cosmetic field of medicine and adds new procedures when appropriate. Faultless all round. It is always a pleasure to see Kay. ..even if I make a decision not to have any treatments. Fantastic advice, treatment and aftercare by Kay. Now 2 weeks after and loving the fantastic results. Initially nervous however I intend to keep up with these treatments when needed. Having been a client of Regents Park Aesthetics for a four years, I cannot recommend this company high enough. I am always delighted with my perfect results and have never required the extra top up services offered to me after my anti wrinkle injections. I look forward to seeing Kay every once, maybe a twice a year, having tried other places, this is by far the best without a shadow of a doubt. You will not be disappointed, so natural and very effective. Very happy with Kay, treatment was pain free and effective. All I can say is so glad I found Kay ….she is the best!!! Would recommend her to anyone considering Botox. Kay is very professional and I’m always so pleased with my treatment. Excellent service. This lady is really good, professional, informative, caring and very gentle with her treatments – not to mention excellent value for money. From the first meeting I was kept fully informed of price, what to expect throughout the procedures and always given thorough aftercare information. I have now had Botox and filler with Kay, both of which have been subtle and perfect for me as I prefer as natural a look as possible. Kay will discuss exactly what you’re looking for and give it to you! After deliberating for several months on whether or not to enter the world of injectables when my first forehead lines started to get more prominent & bother me, i booked an appointment with Kay. I found her to be very informative of the procedure & her whole manner made me feel very calm & reassured. The treatment was so quick, not uncomfortable at all & i started to see the results within 48 hours! I will definitely be back to Kay for regular top ups. Kay Greveson was excellent, she reassured and advised me. I was very pleased with the result, it made me feel more confident and definitely younger. Couldn’t be happier with the customer service and treatment. Would definitely recommend Kay . really pleased with outcome for 10 years younger package ….kay was informative and gave good advice, only thing was that i would say was should include 3 areas rather than 2 for botox. will def be returning to see kay again. Excellent treatment. I felt very confident in Kay’s abilities. She explained every procedure thoroughly and there was no pressure to have more treatment and I wanted. Have you got a more than five star option?….because Kay is the very best. I trust Kay totally. I am 65 and it is vital at this age to be very subtle with aesthetics and Kay has never over treated me. She wants her clients to be fully happy however and is always ready to top-up if necessary. At my last visit I had under eye filler. I felt great when she DECLINED to do my Botox at the same time….”no” she smiled. “IF you have too much eye work done at once it doesn’t look right” . This is an example of her experience, care and wisdom. Like I said Kay is worth more than I’ve stars. I have had botox brow injections from this provider and have always been really pleased with the results. I would never trust my face to anyone other than Kay – she is without doubt an exceptionally talented lady and I would give her 6 starts if it were possible! Kay is the best ! I’ve had treatments from other clinics costing twice the price that don’t even come near to Kay. I have been seeing Kay for 4 years now and continued to come back even in the past 2 years since i moved abroad. I trust her honesty and that she recommends the right procedure for me. She is extremely warm and friendly and have subsequently recommended her to many friends. I have been getting Botox for years and lip enhancement. Irma scared of needles and pain. Kay rubs on a cream that takes the pain away. Kay is also the ONLY Botox person who has talked me out of spending money on my face as she said I didn’t need it! Kay is amazing! The service is great and I am always really happy with the results. Highly recommended! Professional, warm and friendly service and very reasonable priced. Would highly recommend. Kay is lovely – friendly, professional and courteous and explains the procedure etc thoroughly. She puts you at ease and you feel in safe , competent hands. Great results, will definitely be back! Great could not recommend more!!! I’ve been seeing Kay for Botox for 7 years and I wouldn’t want to go anywhere else. She is highly skilled and does everything to make sure you get the result you want. My friends have started going to her because of my natural results and they are very happy as well. I couldn’t reccomend Kay more for her Botox work and kind professional deminor. Thank you as always Kay! I had treatment for a few weeks ago for naso-labial lines and I have to say I’m absolutely delighted with my results. I was extremely impressed by the professionalism and mannerism Kay provided. I will defiently be returning for my next treatment. I had the 10 years younger package which consists of botox and fillers not to especially look younger but to get rid of the lines which niggled me every time I looked in the mirror. This was the first time I had dermal fillers and Kay was brilliant at taking the time to explain the procedure and what I should expect. At no time did she advocate extra treatment which I really appreciate and I am extremely satisfied with the results. Thank you Kay. I shall be returning to you in due course. Kay was professional and reassuring throughout my Botox treatment. She explained the procedure and after care in detail and made sure I felt comfortable throughout. I love the results!!! I’m so pleased with the result of my volbella lip treatment. I don’t have any swelling or bruises & my Lips look very natural and soft, with no lumps. Just perfect as I wanted. I’m so lucky to found you. I have had treatments at 2 different salons before my treatments with Kay and I must say she was by far the best without question. Friendly, professional and the results were just what I wanted. Everything was explained and the aftercare was exceptional. Looking forward to next time. What a confidence boost!!!!! !